I participate in a monthly color challenge. I think its good to sometimes stretch yourself with your art . . . and starting a project with colors rather than the image is definitely a stretch. Its easy to start with imagery and pick the right colors. Its more challenging to reverse the process and start with colors and then try choose the imagery. Mossy Meadow and Poppy Parade. Two greens and a red? My first thought was Christmas! But of course February is the wrong month for that holiday. Then, because its winter here in Wisconsin, I thought about evergreens and cardinals. But I felt the contrast between the two greens was too big a difference to use both greens as trees. In the end I settled on flowers. I like the contrast of the colors, but felt kind of like I was cheating, like there wasn't enough of the 2 greens. So I stepped it up a bit with a 2nd card. The flower on both cards was stamped on the Poppy Parade paper and punched out with the Daisy Punch. 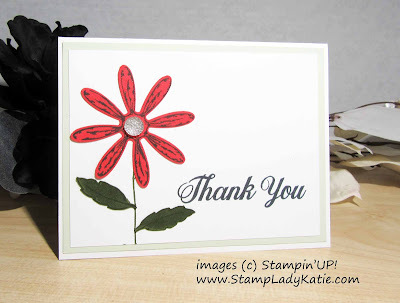 The difference on this 2nd card is that I stamped the leaves on the Mossy Meadow and "fussy cut" them with a scissors. I then glued them over the leaves on stamped stem. I really like the addition of the extra splash of dark green contrasted with the brightness of the flower. I'm not sure how well you can see the sparkle on the petals. 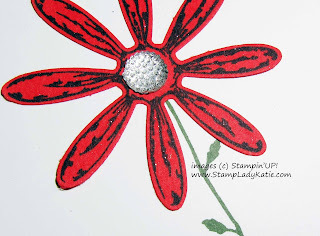 I went around the edges of each petal and down the center with the Wink of Stella pen. It really adds a finished look to the flower. And then because you can never have too much sparkle (right? 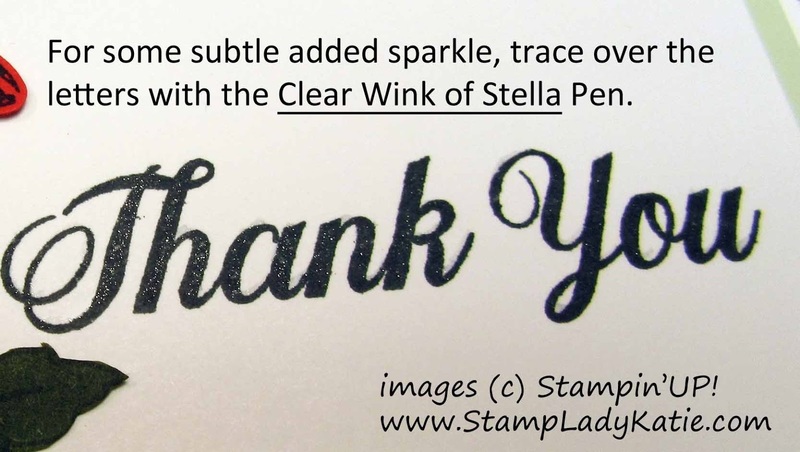 ), I also traced over the letters in the sentiment with the Wink of Stella pen. Its subtle, but very effective. Thanks for hopping by. 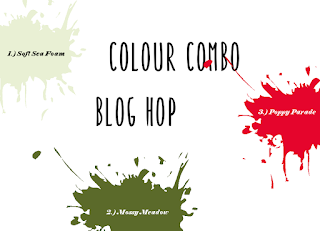 When you have time, you may enjoy browsing my blog for more ideas. 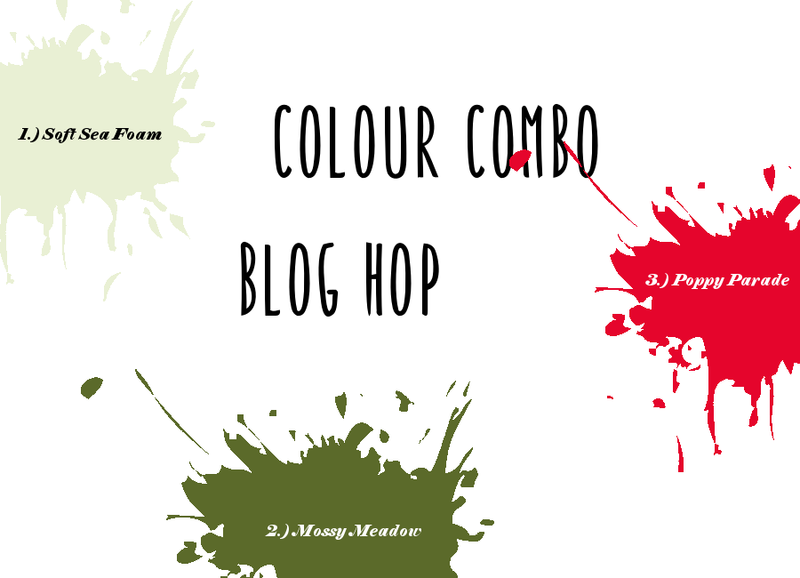 Be sure to check out all the great projects in our February Color Challenge Blog Hop. Click this button to see Astrid's creation. 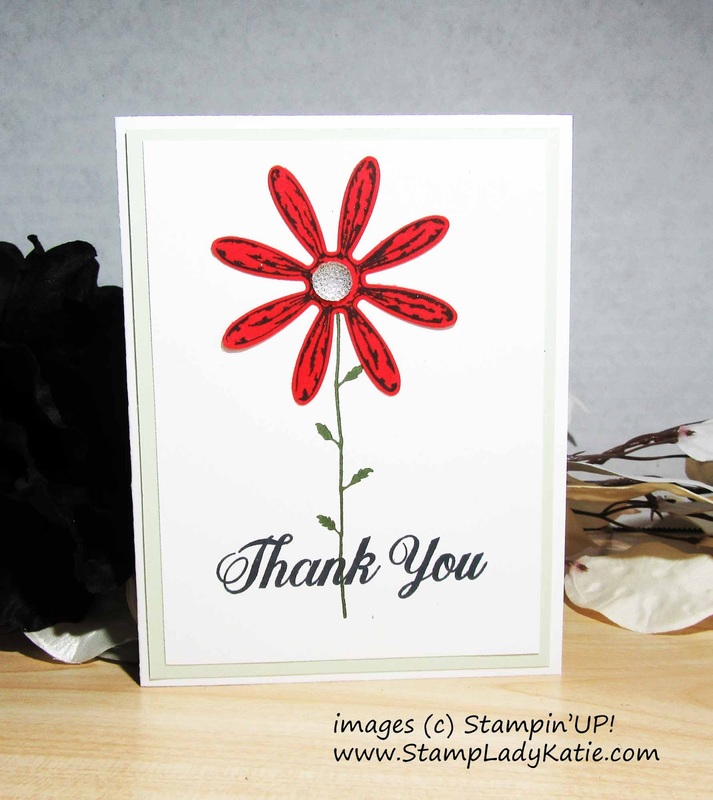 I hope I've inspired you to add a little shine to your next project. 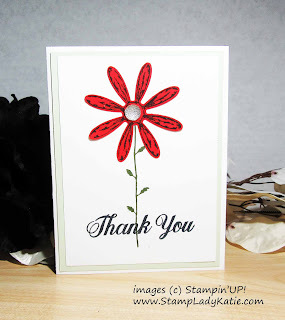 The Wink of Stella pen is amazing and the Daisy Delight stamp set and Daisy Punch are a really versatile combo. I'm happy to answer questions about this or any other project. My email is in the header at the top of the page. Just be sure to use the Rewards Code for the month (found in the left pane of the blog) when you place your on-line order.